This young man produced over 80 poems, only four of which were published in his lifetime, in the year before he was killed – a week before Armistice. The conditions in the trenches were absolutely horrific – reflected by the evocative language describing the physical and psychological making an intense impact on the reader. Two years after he enlisted, Owen underwent treatment for shellshock (PTSD) during which time he met his literary hero, Siegfred Sassoon. Owen returned to the trenches and was awarded the Military Cross for his bravery when he seized a German machine gun killing a number of Germans. Quite a few of his poems amongst which are Insensibility and Apologia Pro Poemate Meo describe the psychological impacts of war. He was killed in the last week of the war. Anthem for doomed Youth: What passing-bells for these who die as cattle? 1914: War broke: and now the Winter of the world With perishing great darkness closes in. 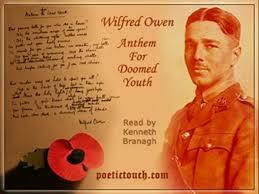 Wilfred was very close to his mother and his letters to her give insight into the bravery of this young man.